Kirun Kapur is the winner of the Arts & Letters Rumi Prize in Poetry and the Antivenom Poetry Award for her first book, Visiting Indira Gandhi’s Palmist (Elixir Press, 2015). 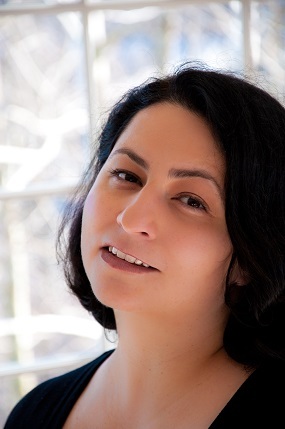 Her work has appeared in AGNI, Poetry International, FIELD, The Christian Science Monitor and many other journals. 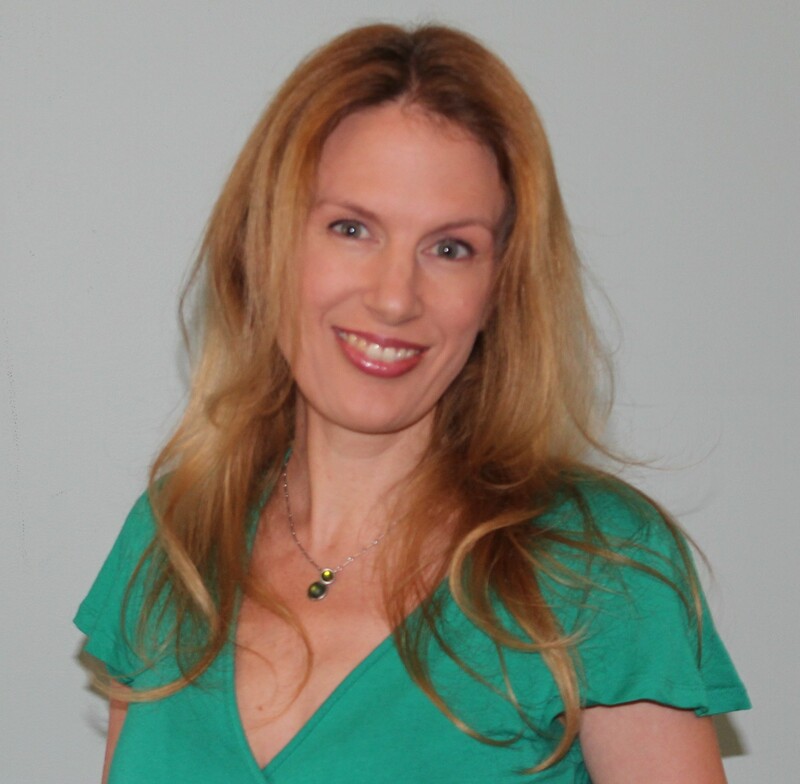 She has taught creative writing at Boston University and has been awarded fellowships from The Fine Arts Work Center in Provincetown, Vermont Studio Center and MacDowell Colony. She is the founder and co-director of the New England arts program The Tannery Series and serves as Poetry Editor at The Drum Literary Magazine, which publishes exclusively in audio form. Kirun grew up between Honolulu and New Delhi and now lives north of Boston with her husband and son. I began writing poems as a kid, mostly when I was bored or in trouble. My parents loved poetry and stories, but my earliest memories of making poems are from my grandmother’s house. There, I was regularly both bored and in trouble (dirty feet on the furniture, inexplicable explosions in the closets). When my grandmother ran out of patience with me, she would install me at the dining table with pen, paper and orders not to touch anything else. I have a notebook full of youthful poems to show for it. I began publishing poems in journals immediately after I finished school, but it took me a long time to publish my first book. I edited the poems relentlessly, cutting out large sections, writing and rewriting. I gave up dozens of times, convinced the poems weren’t good enough (or maybe that I wasn’t good enough). Eventually, I did send the manuscript out. It was the finalist and semifinalist, the honorable mention and runner-up at many, many presses. I cursed and despaired and considered quitting, yet again. But somehow, I just couldn’t stop. I kept working on it and kept submitting. A few years later, in 2013, it won the Antivenom Poetry Prize and was published by Elixir Press in 2015. 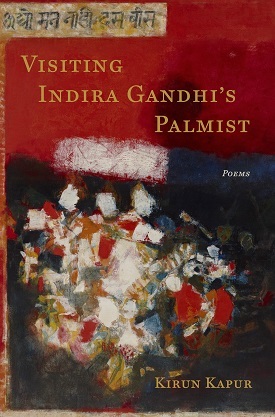 My first book, Visiting Indira Gandhi’s Palmist, is a collection of poems that ricochets from Partition-era India to Biblical pastorals, from American bars to the battlefield of the Bhagavad-Gita. The book explores family ties, personal identity, history and the harrowing collisions of love and violence that force us to reinvent our culture and ourselves. The poems are populated by an array of characters—mothers and fathers, princes and soldiers, daughters and lovers—who try their hardest to understand our most fundamental stories and our most enduring human bonds. I write at home. I’ve tried cafés and libraries, but I need to be alone, unobserved, to really get anything worthwhile done. 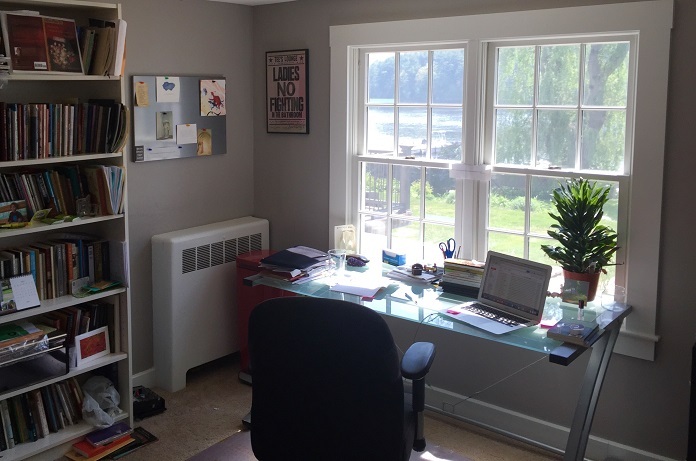 I have a beautiful office that looks out to our garden and down to a river in the distance, but I rarely do any creative work there. I use it to answer emails and pay bills. It houses my poetry books and my endless piles of paper. I tend to do my actual writing in odd spots around the house. I migrate from couch to dining table to comfy chair. My favorite spot to work is in our bed. 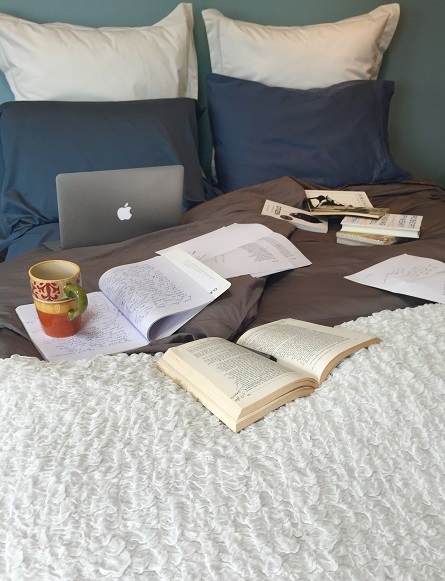 Surrounded by pillows and blankets, I can spread out all my books, drafts (there are so many! ), pens, cups of water and tea. Someday, I’ll be known as the inventor of a new piece of furniture—the bed-desk. I used to love to write late at night. Midnight to 3am was my time. These days, that’s not feasible. I fit my writing around other obligations (work, family etc.). Everyday is different. Sometimes, I have whole, beautiful, blank hours in which to read and write and think, uninterrupted; other days I work on two lines in the parking lot before a meeting or edit a stanza while I’m waiting for water to boil on the stove. My process is different with every poem. Some start with an image, some with a phrase, some with a set of sounds. Some poems take months or years, while others come all at once and are over quickly. Usually, I start on paper and then move to the computer once the poem really feels like it’s underway. Sound matters a great deal to me. Often, I repeat lines or phrases to myself—out loud—as I work. If anyone could hear me, I’d seem like a madwoman! But it’s only once the music of the lines seems right to me that I begin to feel the poem might have a chance, that it might come to life. Books are transformative. I’m changed by what I read and I think I’m changed by what I write. It’s amazing to be involved (both as a reader and a writer) with that moment when a jumble of words and lines becomes something more—something beautiful and meaningful, something alive. I never get tired of seeing how lines or phrases that didn’t exist before come to feel inevitable, necessary and timeless. Or how a writer’s deeply personal worlds are transformed into public art, making the author’s private experience almost irrelevant. I’m also compelled by certain voices and silences—I want to make a place for them. I want them to survive. Part of Visiting Indira Gandhi’s Palmist is about Partition, the 1947 division of British India into the modern nations of Indian and Pakistan. Partition was the largest human migration in modern history. Close to 20 million people lost their homes and livelihoods; almost 2 million lost their lives. The story of Partition was something I really wanted to address in this book. It was a story that was always present in my house (my father lived through it), though it was rarely talked about out loud. In part, I wanted these poems to respond to those silences, to be the voices I sensed but didn’t hear. Books, stories, poems, music, road-trips, all my home-places (Hawaii, India, this corner of New England), all my home-people (my husband, my son, my parents, my dearest friends), all the absurd and lovely and terrifying happenings of the world. Everything. Finding the right and necessary words. That’s the beginning, middle and end of it. I wish I’d known that self-doubt (even crippling self-doubt) is part of the process. It doesn’t go away (at least not in my case), but you figure out how to live with it, how to write through it, under it, with it. Elizabeth Bishop, Arundhati Roy, Anna Akhmatova, Anne Carson, Anita Desai, Jorie Graham, Isak Dinesen, Louise Gluck, Zadie Smith, Carol Maso, Edwidge Danticat, Marguerite Duras, Roxanne Gay.